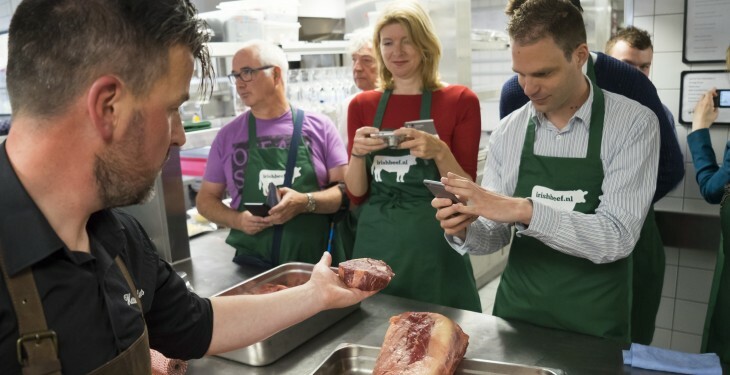 Pictured is the butcher, Barry van Leeuwen from Hesseling Vleesgroup, with some of the Dutch food writers, bloggers and consumers participating in the Irish Beef Masterclass at the Amstel hotel. Irish beef exports to the Netherlands were up 6% to 41,000t and worth over €165m in value in 2014, according to Bord Bia. Bord Bia says the Netherlands continues to be a strong market for Irish beef and it makes up 80% of Irish beef exports. This makes it the fourth most important market for Irish beef exports, Bord Bia reports. The organisation says that 12 of the top retail chains in the Dutch market sell Irish beef and the recent launch of ‘Summer of the Beef Lover’ promotion will raise the profile of Irish beef in the market further. Butcher Barry van Leeuwen and Michelin-starred chef Roger Rassin recently ran two master-classes for food writers, bloggers and consumers on how to prepare and cook the perfect steak, the organisations says. The events, Bord Bia says, took place in the kitchens of La Rive restaurant in the Amstel Intercontinental Hotel and the brand new ‘Creative Kitchen’ culinary centre in Nijmegen’s HAN (University of Applied Sciences) in the Netherlands. Barry took the group through the technical aspects of the beef cuts and explained what makes Irish beef so special, Bord Bia says. The organisation also says that, Roger Rassin, the Michelin-starred chef from La Rive in the Amstel hotel and member of Bord Bia’s Chefs’ Irish Beef Club (CIBC), demonstrated how to cook the perfect steak and the perfect burger.